Each one's journey in this world is met with difficulty. Some have it far more difficult than others, yet no one escapes the harsh affects of the world. There is no one free from regrets or experiences that harmed their lives. Especially when one contemplates bad choices, "what ifs," wrong turns, and permanent scars resulting from the actions and words of ourselves or others who've influenced us, it is easy and even natural to be swept under the tide of hopelessness and despair. And when one reaches the point where he wholeheartedly believes in his own mind that there is absolutely no hope of escape or relief, and that death is the only logical release from such despair, suicide becomes a reasonable option. When there is no end in sight from all the pain of the past, the fresh wounds of the present, and inevitable abuses of the future, one can easily rationalize that whatever comes after death couldn't possibly be any worse than this life. And even if one has a seemingly perfect life -- plenty of money, supportive family and friends, physical and mental health, and all the trimmings -- there are still many problems elsewhere in the world. Even if I have it all, millions upon millions are suffering all around me every single day and night. Families grieve, starve, and mourn. Children are abandoned, abused, and unloved. The innocent are annihilated by bombs, bloodied by wars, and left homeless by natural disasters. Even if I myself have a perfect life, others suffer injustice and evil around me every single day. So then the reality is that my life is not actually perfect because I live in an imperfect and cruel world. The fact that my life is without hardship, while my neighbors are tormented unjustly day and night, is itself a profound cruelty of this world. Then even the one with the perfect life has much to depress his spirits. 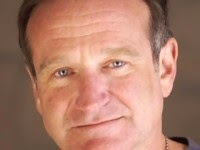 I have no right to judge Robin Williams. Except by the grace of God I would follow the same course. But I know Who is my Redeemer. He lives, and He answers all who call on His name.